She predicted the financial crisis. She predicted Brexit. She predicted Trump. Now Dr Pippa Malmgren shares the signals that will protect you from the next surprise. 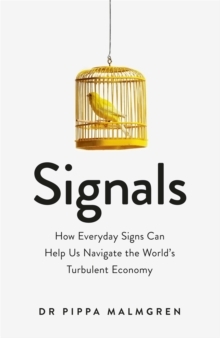 Drawing on a wonderful range of examples - from magazine covers and supermarkets to public protests - SIGNALS is the fascinating story of the world economy told in the language of everyday objects, places and events. Malmgren explains why the size of chocolate bars, steaks and apartments are shrinking, and why the increasing near misses between America's spy planes and the fighter jets of China and Russia are no coincidence. Rising costs and inflation are breaking the social contract between citizens and their states, causing the rise of anti-establishment voting, the return of social unrest to emerging markets and resistance to mass immigration. If the only solution is innovation, then the key question is whether governments support efforts to invest in the economy of tomorrow.